Told through the richest and most comprehensive collection of coffee machines and historical documents in the world. 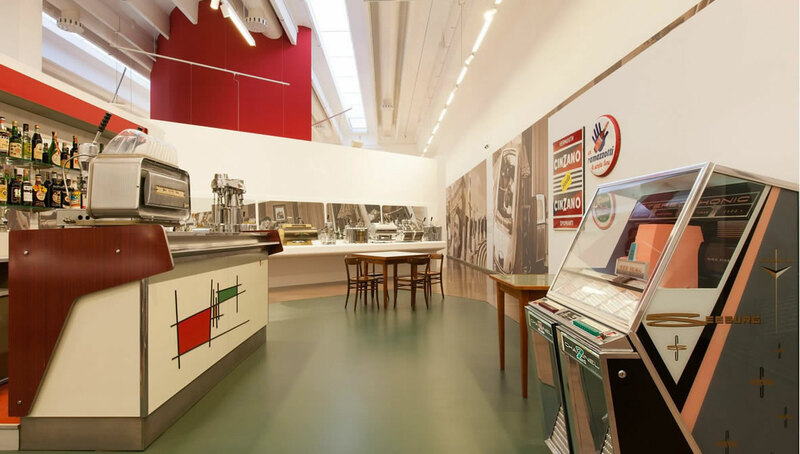 On 12th October 2012, just a few kilometres outside Milan, the Gruppo Cimbali inaugurated MUMAC (Museum of Coffee-Making Machines). It is the richest and most comprehensive collection of coffee machines in the world. Commissioned by the Gruppo Cimbali to celebrate its 100th anniversary, the museum is set out in a modern building measuring around 1700m2 at the Binasco production site, a highly prestigious industrial recovery. 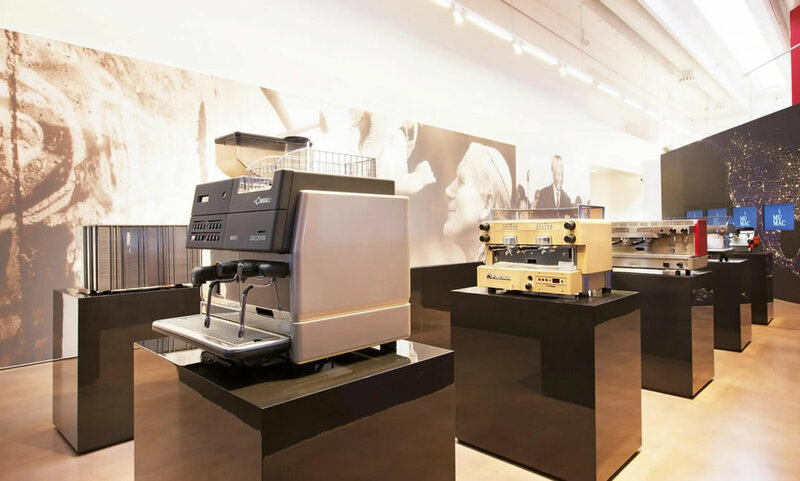 The main aim of the company, a sectorial leader, is to create a permanent exhibition open to the public, able to offer in-depth information about and insights into the history, culture and design of coffee machines. 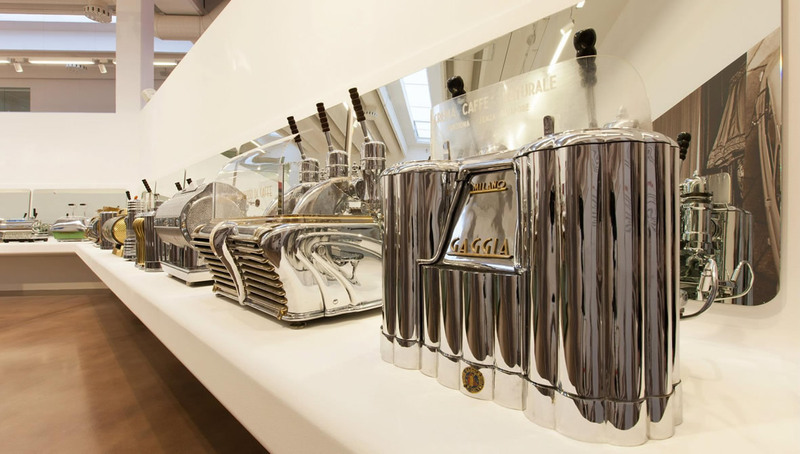 This coffee machine collection represents and protects the Italian heritage in this sector. Technology and Italian design are, in fact, told through a multimedia pathway, packed with audio-visual stimuli and backed up with a range of historically important documents. The story begins at the start of the 20th century, with an Art Nouveau bar set up which was typical of this period and spans the years of the Italian economic boom and development of a new lifestyle, that of going to bars. It covers the design and its explosion with the great creators of the 60s and 70s like the Castiglioni brothers, Sottsass and Giugiaro. The story continues with the international metamorphosis of the 80s and 90s through to the new millennium with the most innovative, highly technological pieces. MUMAC is an experience that enables visitors to relive the onset and development of Italian-made products, thanks to the rich, comprehensive collection of around 200 pieces of the most prestigious brands of Italian industry. Many of the pieces on display are rare, some are unique prototypes, others are examples of extraordinary industrial success. "The museum celebrates Gruppo Cimbali's centenary,” says Maurizio Cimbali, Group President, “an all Italian story which has managed to carve itself out a leading role on the international scenario over four generations. It is an important goal for the company but most importantly leadership based on knowledge and on people who are passionately committed to promoting one of the most ingrained customs of Italian style, that of coffee and cappuccino. MUMAC houses and displays exceptional technological and style content and pays continuous attention to contributing to the development of the espresso coffee and cappuccino culture throughout the world." MUMAC features over 200 vintage coffee espresso machines for bars, bringing together the Enrico Maltoni and Cimbali collections. The former, the most comprehensive and best kept in the world, consists of superb coffee machines protected against the wear and tear of time. Along with the machines, the museum has been further enriched with an historical archive of over 15,000 carefully selected and catalogued documents which will be accessible to public researchers, a classroom for holding training courses, a laboratory for sensory tests and a range of different areas set up to host special events and projects. The history of a brand can help understand the historical course and evolution of companies. MUMAC brings together the brands of manufacturers which are still present on the market after many years such as La Pavoni, La Victoria Arduino, Bezzera, La San Marco, La Cimbali, Rancilio, La Marzocco, La Carimali, Gaggia, Faema, Nuova Simonelli, Elektra, La Spaziale, Astoria, Vibiemme.